Even in a reasonably `developed’ State like Tamil Nadu, the demand, and promise, is not for public conveniences. It was always suspected by a section of economists that the development model adopted by the Anglo-Saxon world in the last century may not be an appropriate one from the point of view of the overall well-being of families and individuals. It could distort priorities, and democratic populism, from the vote point of view, could provide choices that would debilitate the social fabric in the long run. A recent book, The Challenge of Affluence: Self Control and Wellbeing in the US and Britain since 1950 by Prof Avner Offer of Oxford University, explores this area and provides fascinating clues to what is happening in the political theatre of the absurd in Tamil Nadu today. The promise of free television sets is a classic example of the perils of distorted prosperity based on state subsidy in this century. It is not for basic requirements such as water, toilets or electricity but for watching inane serials. Alas, TV sets and toilets are not interchangeable. 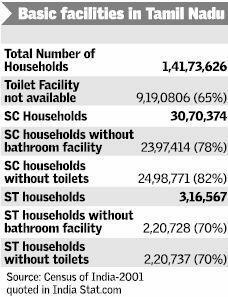 From the Table it is clear that around 65 per cent of households in Tamil Nadu do not have toilet facilities inside their premises. In the case of Scheduled Caste households, around 78 per cent do not have bathroom facility, and 82 per cent do not have toilets. Seventy per cent of the Scheduled Tribe households do not have access to bathrooms or latrines. In the major commercial cities of Tamil Nadu, public roads and streets are being used as toilets, even by owners and employees of small establishments. The promises of political parties do not seem to pertain to such a basic facility, which also indicates the age-old understanding of civilisational ethos. One of yardsticks of civilisation is availability of potable drinking water and drainage facility. The promises made by political leaders do not seem to be in congruence with the ground-level situation and requirements. It is in this context that the insight provided by Prof Offer can help us understand the type of development we are proceeding with. According to Prof Offer, consumer preference for time-using devices of `sensual arousal’ over time-saving investments around home is encouraged in the model of development adopted by the West. For instance, the swift adoption of television in American homes in the 1950s and the 1960s is contrasted with the slower spread of appliances such as dishwashers. Non-corporate activities such as trade, transport other than by rail, and restaurants are more affected by the lack of toilet facilities on their premises. But this does not seem to be the priority for the political parties. Economic development is supposed to create demand for public conveniences and private drainage and drinking water systems. But in a reasonably `developed’ State like Tamil Nadu, the demand is for television sets and not toilets. This brings us to an interesting debate on the developmental model that is being attempted. It has four major characteristics. The first is de-legitimising the responsibility of an individual. It suggests that individuals need not take responsibility for their social and economic enhancement. It is the state which should be held responsible for their acts. The second aspect is discounting the theory of no free lunch. It is not the family or the community of an individual that provides the free lunch; it is the government. In other words, the government tries to take over the role of the family/community. Third, the government also decides the type of facilities/comforts an individual needs and provides them. In other words, the measurement yardstick is with the government, which decides on the quantum of comfort an individual needs. Fourth is the most insidious of the characteristics. It distorts the consumption basket and twists it in terms of “sensual arousal” devices rather than basic facilities or time-saving devices. In other words, the state creates a set of people who are fed with free rice and television programmes. It is not so important which political formation forms the Government in Tamil Nadu as each of them reinforces the above four propositions, which are surely not designed to enhance the entrepreneurial spirit of the households and the risk-taking attitude of individuals. Self-employed groups such as the street-corner shopkeepers, push-cart vendors, vegetable sellers, restaurant owners, truck operators, construction contractors and employees, painters, plumbers, carpenters, fitters, masons, barbers, and a million other service providers, need toilet facilities in their households and also in public locations. Most of them are reduced to using public places as toilets. The problem is acute for women. The freebies offered to the voters, unfortunately, ignores this aspect, which speaks volumes about their approach to households, work-places and the needs of women. The kind of grip films and television have on the on society is unimaginable. Television is the opium of the middle-classes that lulls them into a fictional world. It is time society came to terms with reality and the social and political leaders played an important role in this transformation. ← Are we killing the self-employed?